Locatit at the base o the brain, the pituitary gland is pertectit bi a bany structur cried the sella turcica o the sphenoid bone. Median sagittal throu the hypophysis o an adult monkey. Semidiagrammatic. In vertebrate anatomy, the pituitary gland, or hypophysis, is an endocrine gland aboot the size o a pea an weighin 0.5 grams (0.018 oz) in humans. It is a protrusion off the bottom o the hypothalamus at the base o the brain. 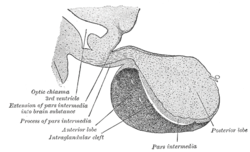 The hypophysis rests upon the hypophysial fossa o the sphenoid bane in the centre o the middle cranial fossa an is surroondit bi a smaa bany cavity (sella turcica) covered bi a dural fold (diaphragma sellae). The anterior pituitary (or adenohypophysis) is a lobe o the gland that regulates several pheesiological processes (includin stress, growthe, reproduction, an lactation).